British niche line Miller Harris will launch La Fumée Alexandrie, a new entry in the brand's series of limited edition fragrances based on 2011's La Fumée (now known as La Fumée Classic). Others in the series include La Fumée Arabie, La Fumée Ottoman, La Fumée Maroc and La Fumée Intense. La Fumée Alexandrie was inspired by the Egyptian city of Alexandria, and features mandarin, lychee, cinnamon, cumin, rose, geranium, incense, papyrus, sandalwood, amber and oudh. 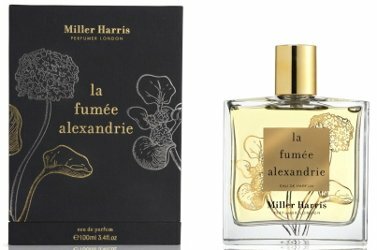 Miller Harris La Fumée Alexandrie will debut in September, in 100 ml Eau de Parfum. You taunt me with a fragrance I can’t easily experience, I’m afraid. There are so many MH fragrances I’d love to try, but I cannot find them in the U.S. I contacted their website, and they do not ship, either. The associate said they were looking to open U.S. distribution I haven’t found it yet. If you guys know where to find the full line, or most of MH stateside, please let me know. Thanks! They used to have US distribution but don’t appear to now. No idea if they’ll be back, sorry! You can find samples of a few of their scents at STC, The Posh Peasant, and TPC. Beauty Encounter, FragranceX and FragranceNet each carry some of the line, and perhaps other discounters do as well. Good luck! Thanks–I’m a long term STC and TPC customer. I was hoping someone had found a MH distributor here. L’air de Rien is the only bottle for which I have a back up. If I had to choose a signature, that might be the one I know MH has candles, body products, and I’d wish to have access to them all. Thanks again!